Roland: These houses remind me of military tents, what do you think? The gargoyles on the Church told me that the thief ran into one of these houses where the cloth weavers live. The Master of the Weavers Guild swore that no one carrying armor passed through. When I asked whether he could see the tower from the houses, he replied that he couldn’t because the church was in the way. Find out whether he can be trusted. Stand in front of the half-timbered house that is the farthest from the tower and count how many small towers you can see on the City Hall Tower. The so-called Wallenstein houses were ordered by the well-known General Albrecht von Wallenstein, Duke of Friedland. 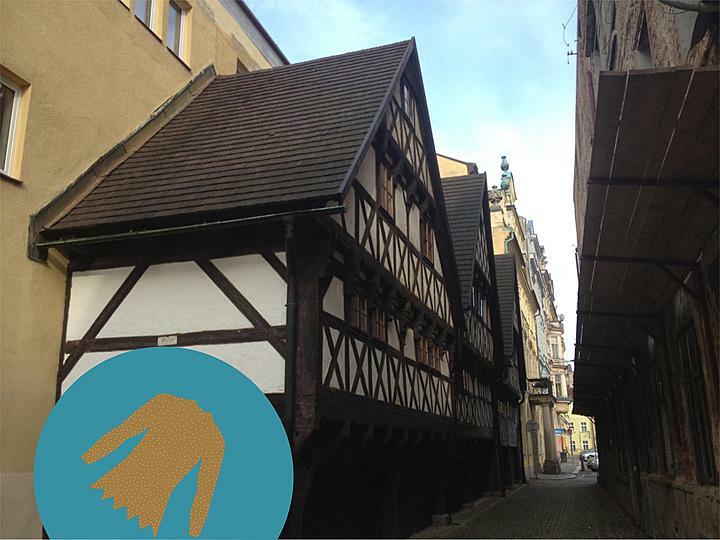 They are the oldest preserved houses in Liberec. Artisans, mostly weavers, lived there. Christmas markets used to take place in the arcades so the children from Liberec used to say that that’s where Santa had his warehouses.